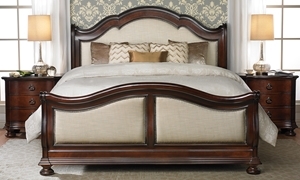 Queen suite crafted from pine solids in a dark cherry finish incorporates intricate detailing and classic 18th century motifs. 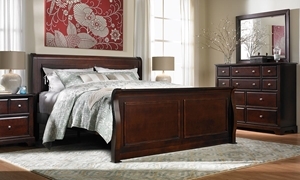 This fabulous suite of bedroom furniture features a beautiful blend of age and beauty. 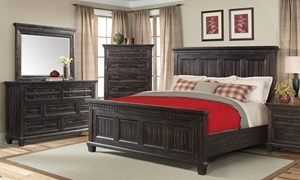 This fabulous bedroom suite features deep graphite toned wood in metal frame work. 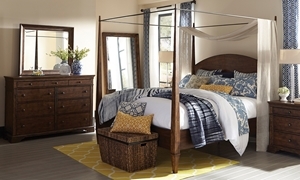 Simple yet sophisticated canopy bed with pencil posts accompanied by matching dresser and mirror in a timeless coffee finish. Sophisticated queen bed, dresser and mirror crafted from solid acacia in a grey oak finish feature thick dentil moldings and hidden storage. 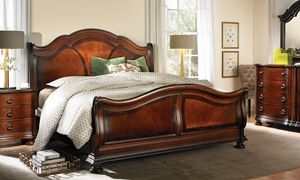 A stunning, Louis Philippe inspired suite of bedroom furniture made for generations of love and comfort. Queen bedroom furniture set with antique cherry finish. Queen bed with antique cherry finish and lots of old world charm. Queen storage bed with six full-extension drawers, matching dresser and mirror with reeded accents in an elegant dark cherry finish. 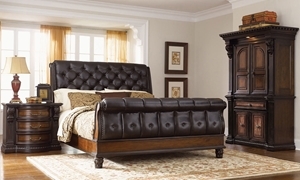 Sleigh bed with tufted leather, carved ornamentation, walnut inlays and substantial trim work. Twin bed featuring louvered insets crafted from pine solids and veneers in an eggshell white finish. 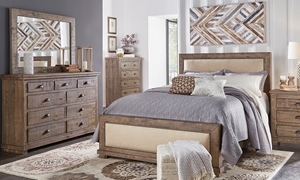 Warm, rustic queen suite features a sleigh bed with two storage drawers and Lamp Assist touch lighting, plus 6-drawer dresser and mirror.